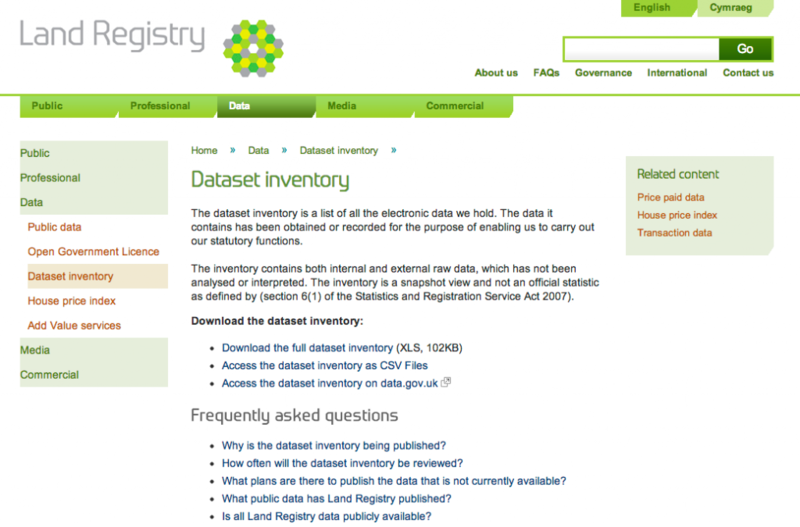 The UK Land Registry has published a Dataset Inventory, listing all the data held inside the organisation, and noting which data it may be possible to release in future. The Land Registry commit to publish all data they can openly license by 2018, and by making clear the data available they are opening up the possibility of their choices about what to prioritise being driven by user demand. The FAQ page about the project lists clear contact details, including a phone number, for asking questions about the data. This entry was posted in 1* Be demand driven, Organisational processes by admin. Bookmark the permalink.